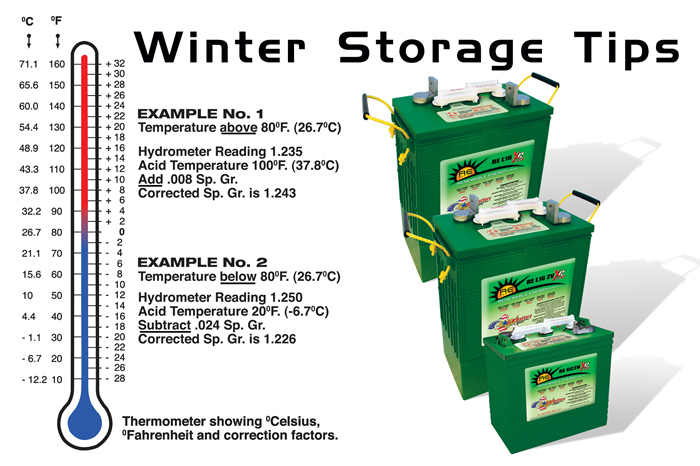 Partial or off-grid applications utilizing flooded lead-acid batteries perform differently during cold winter months. The reason is that FLA batteries have charge and discharge rates that depend highly upon temperature. While warmer climates tend to speed-up charging and discharging rates, cold winter months can slow down the rate of charge/discharge. Because most flooded lead-acid batteries used in renewable energy applications are stored indoors, they're not always subjected to freezing temperatures. Nevertheless, the cold can still increase the resistance in the battery's chemistry and cause a reduction in capacity and charge acceptance. Therefore, it's important that your bank of batteries remain in a location where the temperatures can remain preferably between 50-85°F degrees (10-29°C). A general rule of thumb a battery loses 10 percent of its capacity for every 15-20 degrees below 80 °F (27 °C). With this in mind, you can calculate your power needs and add more battery banks to compensate. Much of this greatly depends on the conditions in which your batteries are stored. While it may sound better to keep your battery packs closer to boilers and other sources of radiant heat, problems can arise when some batteries are warmer than others; particularly if the battery charger is connected to the batteries and to AC power for maintenance charging. Battery manufacturers recommend keeping your batteries in a room that has a consistent temperature. They also recommend that your storage area should have plenty of space between the batteries and between the walls of the enclosure so that air can circulate and help provide some insulation. Also ensure that there's ventilation in the room and that your batteries are away from any other electrical components that can cause a spark. With the proper conditions, you can also determine the state of charge of your batteries by simply checking each one with a hydrometer. The ability to check specific gravity readings in flooded lead-acid batteries is an advantage in cold weather operation. It allows the operator to fully understand the effects of cold temperature on the batteries, and allows them to be properly maintained. As a rule of thumb, subtract four points (.004) from your hydrometer reading for every 10 degrees below 80 °F (5.6degrees below 27 °C). For example; if the temperature of the electrolyte is 50 °F and your battery specific gravity reading is 1.200, you must subtract .012 from your reading. In this case .004 for every 10 degrees equals .012. Subtract this from 1.200 and your corrected specific gravity reading is 1.188. In this example, the battery cell is less than 50 percent charged. Knowing how your batteries operate in cold weather conditions can greatly help you keep track of your battery packs' health, and more importantly allow you to maintain your power needs when you need it most. For additional resources on battery maintenance and ways to increase battery efficiency and service life, visit U.S. Battery's website at www.usbattery.com.